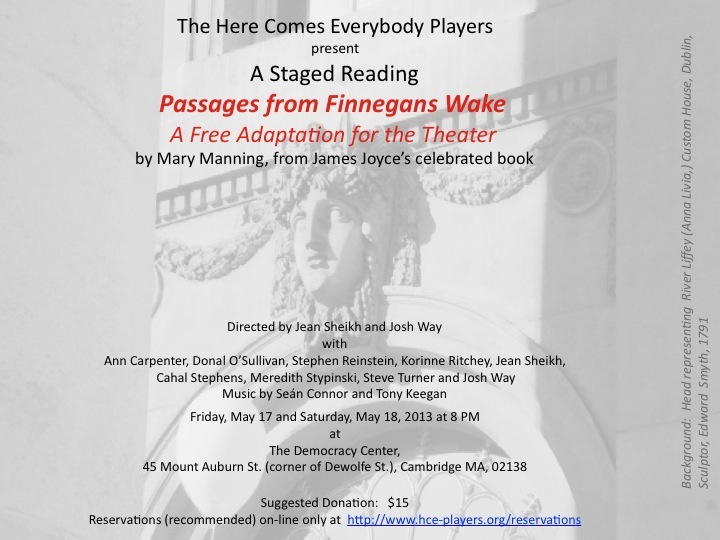 In the mid-1950's, Mary Manning adapted Finnegans Wake for the stage. The work was first performed at the Poets' Theatre in Harvard Square, Cambridge MA. The work has been rarely performed, undoubtedly because of the technical and linguistic challenges that it presents. The Here Comes Everybody Players is experienced in adapting Joyce's work -- including parts of his extraordinary Finnegans Wake -- for the theater. We explored Mary Manning's exciting adaptation of the book through a staged reading and received great feedback from enthusiastic audience members.